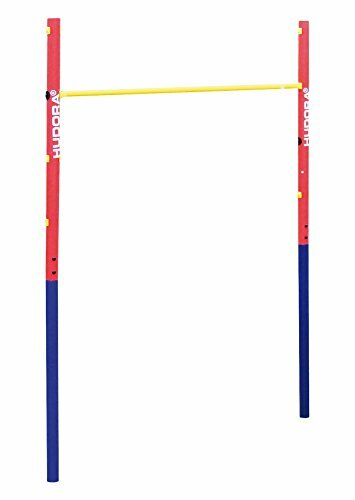 Horizontal bar set for outdoor use. 4 poles each with 107 cm height with cross strengthened supports for the bar. Hudora high-quality, stable, horizontal bar for outdoor use. 4 heights, adjustable from approx. 71.5 to 150 cm. Poles with 107 cm height with cross reinforced bar ends, 50 mm diameter, powder-coated steel tube. Horizontal bar, 118 cm-long, 25 mm diameter, powder-coated steel tube. Includes fastening materials for safe assembly and fixation in concrete. Max. User weight 100 kg. 4 poles. 1 horizontal bar. Measurements (50 cm in the ground): approx. (204) 154 x 123 x 5 cm.